Cryptelo is a Czech startup company that develops both cloud and on premise solution for military-secured data sharing and storing. Cryptelo’s goal was to slowly generate buzz in B2B segment around the product in very limited number of media outlets. The reason for this approach was undergoing development with date of software release January 2015 (which then moved to April). 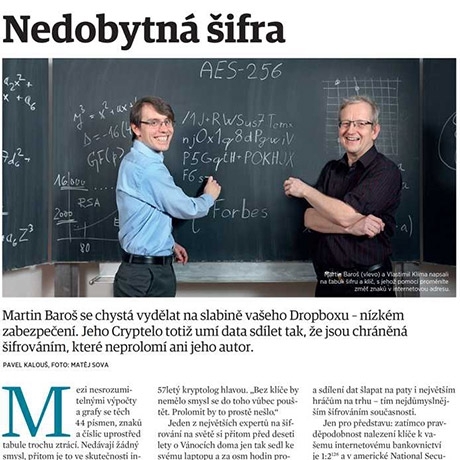 Our approach also required us to precisely select journalists for 1-to-1 interviews with expertise on the business and IT area Cryptelo is targeting. With this task we did our job backwards – we created a list of journalists to target first, not a list of media outlets. Every single month starting October 2014 we organized and published 1-to-1 interview in selected media.